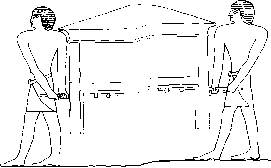 end of the Sixth Dynasty lids are shown in both the shrine and gable form (figure 43). Egyptians used boxes to carry heavy loads over long distances. 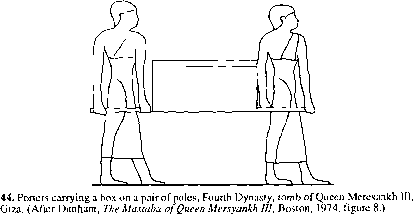 An early illustration in the tomb of Queen Meresankh III shows a plain rectangular box carried on a pair of poles by two porters (figure 44). 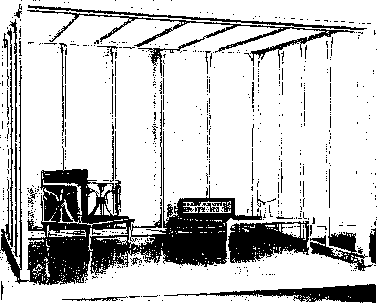 The box appears simply to rest on the carrying poles. The improvement in the quality and design of these larger boxes can be seen in the Sixth Dynasty tomb of Mereruka (figure 45). This box is of frame and panel construction with a gable lid set on a cavetto-shaped cornice with a torus moulding below. The carrying handles are separate elements and can be pushed in under the box when not being carried. The handles, which run in copper staples, would have been shaped so they could not be fully withdrawn. An almost identical box was discovered by Howard Carter in the tomb of Tutankhamun in 1922.